The PC landscape has changed irrevocably in the last five years. Intel, smarting from being behind rival AMD in the processor stakes after the Austin outfit launched the impressive Athlon range of chips way back when, released the Sandy Bridge architecture at the start of 2011, and what an architecture it was. It was Intel's engineering at its very best. Good old Sandy came tearing into town armed with both performance and energy efficiency in spades. CPU performance was predictably strong, but Intel also used the Sandy Bridge launch as a pretext to dabble with improving onboard graphics, which is a trend that continues today. It's very telling that the best Sandy Bridge processor, Core i7-2700K, is still considered decent four years on, and those with enough foresight to purchase it at that time haven't felt the need to upgrade. Ivy Bridge has come and gone, Haswell is probably powering your PC right now, while Broadwell has barely made a whimper. The lack of mainstream performance enhancement is reinforced by the notion that Intel's gaze is elsewhere, most notably fighting the good fight in the mobile space. Desktop processor evolvement has slowed as a result, though AMD must take some of the blame - if the original Athlon lit a huge fire under Intel the latest APUs and FX chips barely register a small candle. Intel knows that any new architecture needs to span a wide segment range, from 150W-plus server chips to sub-5W fanless processors. That new architecture for 2015 is Skylake. The desktop Skylake rollout is interesting insofar, like Broadwell, it's initially limited to just two processors - Core i7-6700K and Core i5-6600K. This is Intel saying that it can launch processors as and when, dictated by its internal roadmap timing and machinations rather than external influences. Skylake follows quickly after Broadwell, intimating that Intel is finally papering over the obvious cracks that existed with the nascent, low-yielding 14nm process earlier in the year. So how do the Skylake duo sit in the pantheon of recent Intel chips? 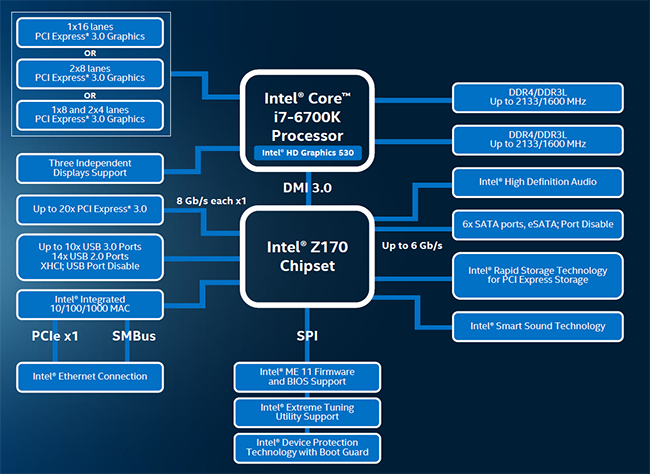 The Core i7-6700K uses the now-familiar four-core, eight-thread topology found on all class-leading chips. Intel calls this 4C8T, and it's common on all processors going back to Sandy Bridge. The chip giant continues to be conservative with respect to frequencies as the chip runs at 4.0GHz on all four cores but tops out at just 4.2GHz. Skylake, then, operates at a lower frequency than the Devils Canyon Core i7-4790K and, frankly, not that much quicker than Core i7-2700K from 2011. Of course, basing expectation on frequency alone is only half the story. Incremental architecture enhancements boost the instructions-per-clock-cycle throughput and consequently increase overall performance. In other words, a 4GHz Skylake chip should be faster than a 4GHz Sandy Bridge. Intel beefs up the integrated graphics to HD 530 but, just like the processor, at this time, doesn't divulge any architectural details - those will arrive at the upcoming Intel Developer Forum starting August 18. Different form factor but the same packaging style as previous Core chips. What we do know is that Skylake is presented in a different form factor known as LGA1151. This is important because it denotes both a socket change and consequently a slew of new motherboards based on the Z170 chipset that we're covering in a separate review. A bump in specification for the chipset. The pertinent points are that Skylake processors use either dual-channel DDR3L or DDR4 memory at up to 2,133MHz speeds and offer more granular overclocking than ever before; Intel says that enthusiasts can overclock the unlocked Core i7-6700K in 1MHz base-clock increments. A standard 16 PCIe 3.0 lanes are still attributed to the graphics, split in the same way as Z97, but it's interesting what Intel has done with the expansion capability of the Z170. Z97, if you remember, had an additional 8 PCIe 2.0 lanes attached to the chipset; some motherboard manufacturers used them to include PCIe x1 slots and various high-speed peripherals, but most ran into difficulties when catering for super-fast storage that required multiple lanes on its own. Intel realised this and now increases the chipset-based PCIe lanes to 20 Gen 3.0, and this means that motherboard guys don't need to worry about housing and routing the latest generation of M.2 solid-state drives - Intel has finally taken the lane arbitration issue away. We expect to see boards with multiple M.2 slots each capable of x4 PCIe 3.0 bandwidth. Appreciating that the chipset now needs to communicate with the processor through a faster link due to more traffic generated via the enhanced PCIe lanes, the Direct Media Interface (DMI) is upgraded to 3.0, promising speeds of up to 8GT/s. In other news, Intel ups the USB 3.0 complement to 10 ports, instead of six on Z97, but there's no chipset room for USB 3.1. Let's be clear. Those investing in the Skylake K-series platform need to purchase the processor, LGA1151-based Z170 motherboard and DDR4 memory in one fell swoop. The platform will be more expensive than, say, Haswell because the Skylake motherboards and DDR4 memory attract a reasonable price premium. The good news is that you can reuse any recent Intel-specific cooling because motherboards feature the same mounting holes. Other Skylake-based chips will fill out the sixth-generation Core portfolio in Q3 2015, according to Intel, though early adopters are limited to just these aforementioned two. Today's review focus, the Core i7-6700K, is to arrive at retail in the next week or so armed with a £275 price tag, thus making it broadly consistent with today's mainstream champ, the Core i7-4790K. Want to see how all the class-leading Intel IGP-laden chips from the last four years compare against one another? Read on.